The Net Return introduces our NEW Golf Simulator Series. The Net Return Simulator Series provides golfers with the ultimate golf experience when using their favorite simulator software. This includes SkyTrak, OptiShot, TruGolf, About Golf, P3Pro, Foresight, etc. The Simulator Series is designed for high performance training environments including; Teaching Academies, Country Clubs, Indoor Golf Facilities and even inside your Home. Aluminum Frame, High Impact Netting, Textilene Display / Impact Screen, Side Barriers (Pair), Sandbags (6) and Rugged Duffle Bag. Height: 8'10" (Rear Display Bar) * With Projector Mount Kit Installed Height Increases to 9 feet. If you have any questions regarding the The Net Return Simulator Series Golf Studio Net, please give us a call, we would be happy to help you with any questions you may have. 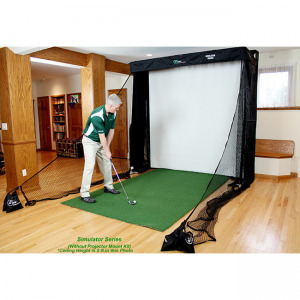 Write an online review on the The Net Return Simulator Series Golf Studio Net, and share your thoughts with others.